When Timothy Franz Geithner (pronounced GITE-ner), 47, began work at the New York Federal Reserve in November 2003, he was met with quite a bit of resistance. A number of insiders saw him as a poor choice; Tom Schlesinger, executive director of Virginia-based think tank the Financial Markets Center, noted that "there is very little in Geithner's resume that shows experience in regulatory issues," lamenting that his appointment "raises questions about the willingness of the New York Fed to aggressively supervise financial holding companies in its territory." Since Nov. 21, though, when word leaked that Geithner would be named Treasury Secretary in Barack Obama's Administration, reviews have been somewhat more positive. (See pictures of Barack Obama's campaign behind the scenes.) He's now an insider himself, knee deep in the unfolding economic crisis, who has worked closely with former New York Fed chief Gerald Corrigan, former U.S. Fed chief Alan Greenspan and current Treasury Secretary Henry Paulson and head of the Federal Reserve Ben Bernanke. But Geithner's confirmation as Treasury Secretary hit a new snag on Jan. 13, when reports revealed that he had failed to pay about $34,000 in taxes when he was employed by the International Monetary Fund. 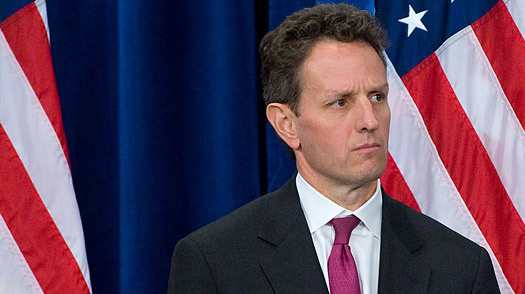 Geithner maintained that he had no knowledge of the error and Obama quickly came to his defense saying, "My expectation is that Tim Geithner will be confirmed." The debts were subsequently paid, but Geithner still must answer to the Senate for the incident. His official nomination hearing is set for Jan. 21.  According to a profile in The Economist, Geithner "snowboards, has tried skateboarding and exudes a sort of hipster-wonkiness, using 'way' as a synonym for 'very' as in 'way consequential'"